For months politicians have threatened to not raise the debt ceiling, but not many people thought it would get this far. 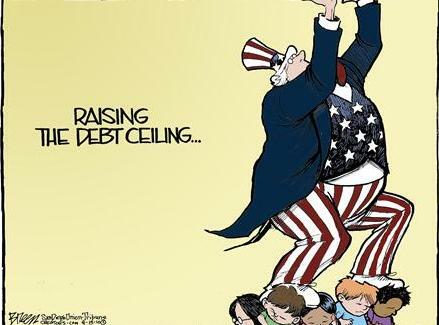 In just under 3 weeks, the US will hit the “debt ceiling,“ which is our country’s borrowing limit. Both Republicans and President Obama want to reduce the deficit as part of raising the debt ceiling. How they want to accomplish that is where they find great differences. Democrats are asking to simply vote on raising the ceiling and then deal with the deficit in a different vote. The President and Democrats want to balance the budget largely with tax hikes to help pay down the deficit. Republicans demand that there be no increase in the ceiling without equivalent spending cuts. They oppose tax hikes to reduce it. The media is in a frenzy reporting there will be an economic apocalypse on August 3rd if Congress doesn’t come to some agreement. Is this the end of our economy or the beginning of a new recession or even a depression? In a recent article published by the Rapid City Journal, Rick was asked what effect he expects if the August 2nd deadline passes without a raise of the debt ceiling. His answer was clear and honest. He said he really didn’t know what the effect will be, but that he expects the market will overreact as it usually does to scary news. If this happens, and markets do take a tumble, it may present some very unique buying opportunities. Nothing fundamental about our economy will have changed and yet prices may still drop, which means that the entire market may be undervalued. Of course, the opposite could happen if Congress reaches agreement and markets take a sharp rise. This would indicate the market has already priced in the uncertainty. And, we could see the 2nd come and go without any agreement and watch the markets do absolutely nothing. The bottom line is that no one really knows. Still, many of you are wondering what our best guess is about what will happen. We don’t think our politicians will find it tolerable to hold off on raising the ceiling for long. So, what should you do? Nothing. Fundamentally, we don’t believe in timing the markets. Our advice is to stay the course in a diversified portfolio of 8 to 10 asset classes. It’s probable that if the stock markets do sell off, a few of the other asset classes will actually rise. Think about this scenario on August 3rd, assuming the ceiling isn’t raised. There won’t be enough money for the government to pay all of its bills. The treasury will have to prioritize spending, and it has incentives to do two things: be sure the country doesn’t default on our debt, which would raise our cost of borrowing in the form of higher interest rates; and get the debt ceiling raised as quickly as possible to avoid continued budget issues. We fully expect that bond holders will be paid first, and voters will be prioritized last in the form of delayed Social Security, pension, and military pay checks. This will cause an uproar, and politicians will be forced to act quickly. It is possible, even likely, that not raising the debt ceiling will cause the US to lose its coveted AAA credit rating. This may not have the effect everyone thinks, however. If we can get our spending and borrowing issues under control, we will continue to be the lowest risk investment environment in the world, which will keep interest rates low. They may possibly spike for a short while, however they will most likely return to their current levels since the market will likely dictate it. Overall, we suggest you don’t lose sleep worrying about the “Debt Ceiling Crisis.” The markets may be affected in the short-term, but they will most likely rebound at some point. Our seniors may miss a Social Security check, but they will be reimbursed as soon as the ceiling is lifted. In the end, this will probably be a non-event, ending with the US kicking the proverbial can down the road in the form of not making any substantive progress toward reducing our deficit spending and borrowing addiction. 3 Responses to August 2nd-A day that will live in infamy? We both know that it will take a combination of tax increases and expense cuts to make this thing work. In a great world we would get a wonderful reworking of the tax code at the same time…but not before 8/2 (some might not think it so wonderful if they loose things like the home mortgage interest deduction….though people who rent don’t get a deductioni). As for the markets, I believe there could be an over-reaction if there is a failure to act. Although I’m not moving money out of equities when it is already invested, I am waiting to invest new money until this thing resolves. Market timing? Or common sense…..
Great perception, Rick. Spot on! Personally, I hope we take the “hit” now, and not delay the inevitable with even higher numbers to balance. I agree with your premise that the underlying economy is sound. However, the problem of the US having its credit rating downgraded should our politicians blow it is great and that would cause many pension funds to either change the language of their investments (safe stuff which is all invested in treasuries etc.) because US securities would no longer fit the bill. the demand would drop which would have a similar effect to Lehman’s collapse. The fed reserve would probably step in to buy treasuries but that only goes so far.